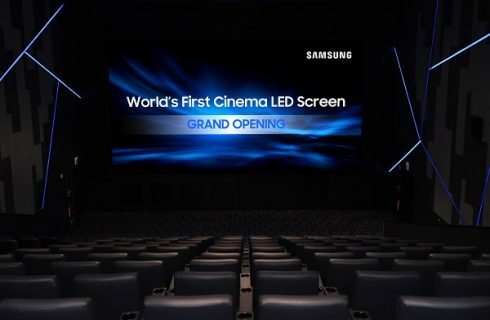 Samsung Electronics announced it has installed its first ever commercial Cinema LED Screen at Lotte Cinema World Tower in Korea. Designed as a High Dynamic Range (HDR) LED theater display, the Cinema LED Screen creates a more captivating and vibrant viewing experience through next-generation picture quality and true-to-life audio thanks to collaboration with HARMAN Professional Solutions. Stretching nearly 10.3m (33.8ft) wide in size, the Cinema LED Screen accommodates a variety of theater configurations while ensuring superior levels of technical performance, reliability and quality. The display brings the visual power of HDR picture quality to the big screen, and enlivens content with both ultra-sharp 4K resolution (4,096 x 2,160) and peak brightness levels (146fL) nearly 10 times greater than that offered by standard projector technologies. Additionally, the Cinema LED Screen’s futuristic, distortion-free presentation leverages ultra-contrast and low-tone grayscale settings to showcase the brightest colors, deepest blacks and most pristine whites at a nearly infinite contrast ratio. To go with the stunning video technology within the ‘SUPER S’ theater of Lotte Cinema, Samsung has paired its Cinema LED Screen with state-of-the-art audio technologies from JBL by HARMAN. This integration includes powerful speakers bordering the screen, proprietary audio processing technology, and JBL’s Sculpted Surround system, producing an unparalleled sight and sound experience the way the content creators intended. As demands within the cinema space evolve, Samsung’s Cinema LED Screen offers the versatility to expand services to meet a wider range of audience needs. The display maintains its advanced presentation capabilities in a range of dark and ambient lighting conditions. This flexibility makes the Cinema LED Screen ideal for venues wishing to use their theater space for corporate events, concerts, sports event viewing and gaming competitions. Prior to its commercial debut, Samsung ran the Cinema LED Screen through a series of the industry’s most rigorous tests to validate its performance and presentation. In May 2017, the Cinema LED Screen became the first product to achieve full compliance with the highly-esteemed Digital Cinema Initiatives (DCI) theater technology standards prior to its commercial release. This certification acknowledges the display’s ability to showcase the complete color spectrum with unaltered accuracy.